(NIU) Introduction and Discussion. The level of partnership with ANSF units largely depends on the individual coalition commander’s discretion whether it is a partnered unit or an advisor team. Although this discretion is important to empower leaders on the ground, the current parameters in partnering guidance are very broad which leads to varying levels of effectiveness and consistency. Standardized guidelines would provide specific tasks (e.g. develop and conduct all planning and operations from a Joint TOC) to units designated as ANSF partners. Additionally, true embedded partnership improves ANSF development, mission accomplishment and force protection. The recommendations in this paper offer uniformed standards throughout diverse allied forces, assistance during RIP/TOA, improvement in the development of the Afghan forces, and a path to effective transition. (NIU) Doctrine as a First Step. Standardized procedures that mandate embedded partnership principles should be introduced to ensure collaborative arrangements are as effective as possible. The first step to partnering is coalition familiarization with current doctrine. Two examples of existing doctrine include U.S. Army FM 3-07. Security Force Assistance (2009) and U.S. Army FM 3-24.2 Tactics in Counterinsurgency (2009), which contributes to a structure for partnering. All allied doctrine, which addresses Security Force Assistance type operations, should be considered in order to provide detailed parameters in relation to ANSF capabilities. (NIU) Joint Tactical Operations Center (JTOC). Embedded partnership works most effectively when implemented at all levels. A fundamental element of partnering is establishing a Joint Tactical Operations Center (Joint TOC or JTOC). Establishing a Joint TOC will increase the overall capabilities of both the coalition and Afghan forces. Additionally, it helps compensate for the shortfalls of the individual forces‟ limitations during operations, and provides a model for assimilation by the ANSF. The ANSF are much more adept at interacting with the populace; a JTOC provides enhanced intelligence gathering and situational awareness within the local communities. This intelligence can then be „actioned‟ by the combined coalition and Afghan forces. Operating a Joint TOC with shared planning, operations, intelligence, and sustainment cells allows coalition staff officers to simultaneously teach, coach, or advise their partners based on capabilities. This will also provide a forum to improve the ANSF and introduce their contribution of human intelligence and situational awareness to planning and operations. The end-state would be ANSF operating a TOC without assistance of coalition partners and advisors. OPSEC is always a concern when dealing with the host nation, but does not disqualify joint cells within the multi-national coalition, and therefore should not be discarded as a concept strictly because of security concerns. The more embedded the units, the stronger rapport and trust. A “one team” mindset, where units operate side-by-side and shares the danger, reduces the OPSEC risk. Without sharing the hazards, a lack of trust and limited rapport adds to the danger for coalition forces. Compartmentalization and care of sensitive information will add to mitigating the hazards to operational security. (NIU) Depending on the force structure an Integrated Command Teams (ICTs) and/or Operations Coordination Centers – District (OCC-D) may serve as an added collaboration with the ANSF as well as local GIRoA. COIN Guidance defines an ICT as “a committee of district level representatives from GIRoA, ANSF, development agency representatives and ISAF. ICTs are formed in order to strengthen local unity of effort in governance, development and security by synchronizing, planning, de-conflicting, and sharing information at the district level.” ANSF are also establishing OCC-Ds as wells as OCC-Ps and OCC-Rs (Provincial and Regional respectively) as a method to utilize surge recovery and transition to reorganize themselves. Ideally, though case dependant, a Company Command Post (CP) collocates with either an existing ANP or ANA CP at a District Center. 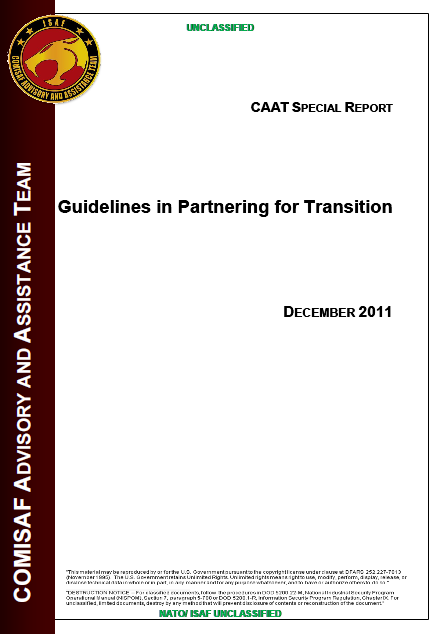 This combined effort provides a centralized location for the ANSF to coordinate with ISAF.